From the airport follow the signs to the city center accessed through the tunnel. Turn left at the first set of traffic lights after the tunnel. The Hilton Corniche Hotel Apartments is the third building on the left-hand side. 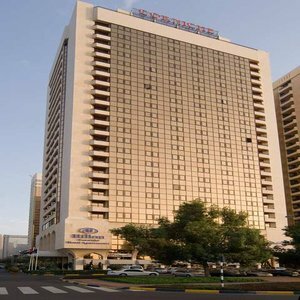 Overlooking the Arabian Gulf the Hilton Corniche Hotel Apartments is within walking distance of the business district just 0.5 miles from the center of Abu Dhabi and 21 miles from Abu Dhabi Airport. The hotel has a Guest Lounge with 4 PCs and wireless internet access. Enjoy international dishes and Gulf views at the Hamptons Restaurant or pop into Cafe Cappuccino for coffee in the Hilton Corniche Hotel Apartments* Lobby. Keep fit in the Hilton Corniche Hotel Apartments* rooftop pool and gym. Relax with a massage or a sauna. Let trained stylists change your hairstyle in the hair salon. Enjoy retail therapy in the shopping malls half an hour from the hotel. Relax at the Hilton Beach Club 3 miles away. Enjoy a Hilton Room with a city view or step up to a Suite with a sea view. The Hilton Corniche Hotel Apartments* Junior Suites and Suites have kitchenettes.